"You are loyal to everyone, aren't you?" I recently came across a corner in WWII history that I had never heard about. Well, that's not too surprising considering there's so much learn about the second world war! But still, you'd think it would be a more well known fact that eight Nazi saboteurs landed on American soil with explosives. Anyway, I ended up learning about this while getting sidetracked on research for my WIP. I think it may have been briefly mentioned in a book I was reading, which led me to research Hitler's plans for attacking America, which led to the sabotage plot. 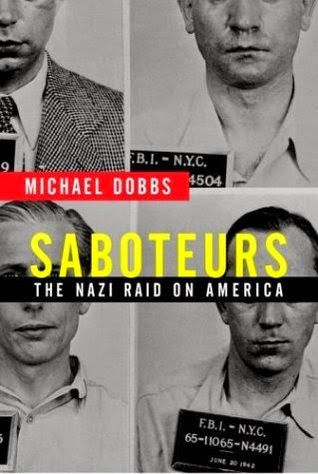 I checked out a book at the library called Saboteurs and finally got around to reading it. There were eight Nazi agents sent by U-boat across the Atlantic with explosives in 1942. They were targeting American railroads and war factories that produced iron, aluminum, and steel. A few of these factories were in NY, IL, TN, and PA.Their plan was, if America didn't have the materials to build tanks, submarines, and airplanes to aid the allies, the Axis had a better chance of winning the war. Hitler hated America and American soldiers, but he did have great respect for the American war industry. 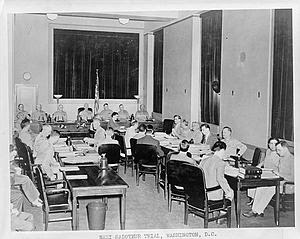 "The great success of the Americans consists essentially in the fact that they produce quantitatively as much as we do with two-thirds less labor..."
The Abwehr – German intelligence organization – started training 8 Nazi saboteurs.They taught them how to blow things up, for lack of a more elegant description, and write secret letters. 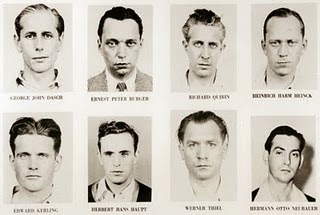 All eight saboteurs had lived in the U.S. at some point in their lives and could speak English. Two were actually American citizens. 1. To carry out sabotage attacks against vital economic targets. 2. To stir up discontent and lower fighting resistance. 3. To recruit fresh forces for these duties. 4. To reestablish disconnected communications. These 8 saboteurs split up into two groups. Each group was transported by U-boat (I'm suddenly fascinated and terrified of U-boats now). One group, led by George Dasch landed at Amagansett on Long Island, New York. The other landed south of Jacksonville, Florida at Ponte Vedra Beach. The four in the above picture were the Long Island group. The bottom were the Florida group. It was known that German U-boats were off the East coast, but acts of sabotage seemed to be things of Hollywood and not real life. It seemed to be a far-fetched idea. "People had grown accustomed to the protection afforded by two great oceans." He gave Cullen money as a bribe to forget what he had seen. Then, Dasch took off his hat and told Cullen to look in his face. "Look at my eyes. Would you recognize me if you saw me again?" "No, sir, I never saw you before." "You might see me in East Hampton some time. Would you know me?" "No, I never saw you before in my life." "You might hear from me again. My name is George John Davis." Once Dasch fled, John Cullen notified his fellow coast-guardsmen and a search began on the beach. "They felt scared and venerable; a war that a few hours ago had seemed far away was suddenly right there, on the beach." 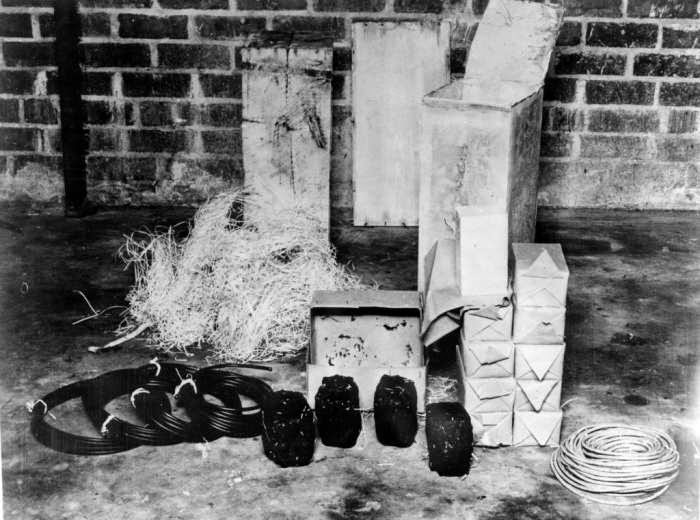 The saboteurs immediately began burying the boxes of explosives in the sand dunes so as not to be caught with the incriminating evidence. They were going to come back for it when the sabotage plans were ready to be carried out. They escaped into the night. It didn't take long for the FBI to find the boxes because clothing and other objects were scatted along the beach, leading them to the hidden boxes. "It did not take him long to conclude that there was enough material in the boxes to do millions of dollars worth of damage to the American war industry." "I never intended to carry out the orders." Burger was the one who scattered evidence on the beach for the FBI to find the hidden explosives. "Together they would open the eyes of the German people to the truth about Nazism." Dasch contacted the FBI. The FBI was often contacted by crazies, so they looped Dasch in as one of those unwanted callers. All the while, the two other agents in Dasch group were growing suspicious of him and Burger. Dasch finally made it to Washington were he told all, and the FBI tracked down the other saboteurs. In Florida, they captured the leader of the second group, Kerling. He agreed to show the FBI were the explosives were hidden. "As the agents began digging in the sandy soil, the cocksure Nazi Party member who once boasted that the American soldier was no match for the German slumped to the ground, clutching his head between his knees." "George Dasch was your leader, I take it." "And you obeyed all his orders?" "Would you have obeyed his orders to spy in this country?" "He was your fuehrer, was he not?" "You would have obeyed all his orders to commit sabotage?" He was asked what he would have done if Hitler himself had ordered him to blow up factories. "I don't know. I never met the fuehrer. I don't know what kind of man he is. How can I answer that?" "Are you a loyal German or a loyal American?" "I am loyal to the people of Germany." "How about the people of America? Are you loyal to them, too?" The cases of Burger and Dasch were very complicated. Burger was in a position where he could be put to death in Germany as a traitor, and put to death in America for being a traitor (he was a U.S. citizen.). Burger ended up getting sentenced to life in prison. "Since the end of the trial, Burger had withdrawn almost completely to himself. He was lying on his bed reading the Saturday Evening Post when Cox entered his cell. He looked up from his magazine long enough to say 'Yes, sir' as the provost marshal informed him that he had been sentenced to life in prison, and then resumed reading his magazine." Dasch got 30 years. 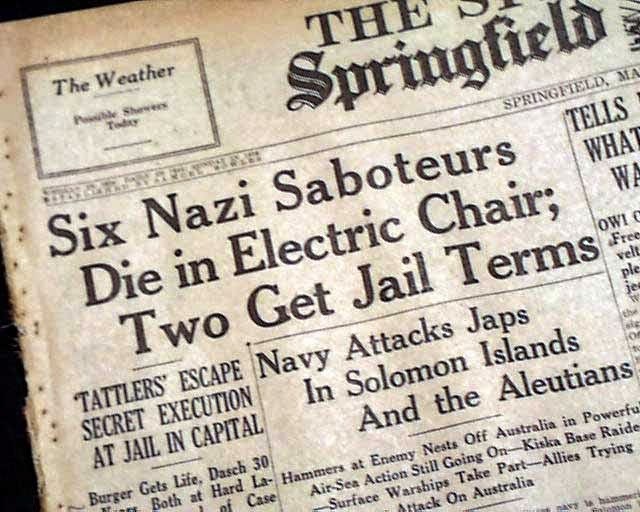 The six other saboteurs were executed in the electric chair in August 1942. But in the 50's, Dasch and Burger were both released. Burger was deported back to Germany and Dasch fled to Russia. It's crazy because as I was reading this, they were mentioning places these saboteurs were – walking along Broadway, in Cincinnati, in Washington D.C., and eventually buried on the edge of D.C. along the Potomac river. I've been all those places and never knew about this piece of WWII history. I feel like I summed up a ton of details in this post, so if you're wanting to know more, read Saboteurs. It was a very interesting read about this piece of history. Thankfully, they weren't able to carry out the sabotage. Age Level: Young adults and up. Have you ever heard the Nazi sabotage story before? Oh, wow, Emily! This was so cool!!!! Isn't it so interesting?! There are so many parts of WWII history to learn! =) Thanks for commenting! That is fascinating. I was aware of attempts to infiltrate into the US and other stuff, but I never heard of these saboteurs. I will have to write down the name of that book. By the way, have you ever seen Hitchcock's 1942 film "Saboteur"? Reading this story reminded me of the movie. I've heard of that movie but I haven't watched it yet. I'll have to do that soon!! =) Thanks! For sure!! Thanks for commenting, Jessica! Actually I had heard of the Long Island group but never really got the full story. Very interesting! That's great that you already knew about the Long Island group! I found the entire story very interesting! I had no idea this ever happened! Thank you for sharing. I think war history (especially Civil and WWII) are so fascinating. I do, too!! Thanks for commenting, Iris! This is seriously so fascinating. I want to write a story centered around this now. I did not know about that! It is so interesting! Thanks! I found it really interesting, too! Thanks for commenting, Clara! WOW! Thanks for the interesting history bit. I'm a WWII buff and I'd never heard of them before. I learned a lot. Thanks! "Forgive me, comrade; how could you be my enemy?"